The Pentland Hills, to the south-west of Edinburgh. Please make sure to add the tour to your booking when you register. For history lovers, this Mercat Tours trip takes you around the underground city beneath central Edinburgh with a guide to the history of the vaults. Beneath the bustle of Edinburgh’s Old Town you’ll discover a dark, damp world unchanged since the 18th century. You’ll explore their history – including how they became home to the city’s most destitute inhabitants. The tour runs for 2 hours between 17:00 – 21:00 and finishes with a glass of whisky! Scotland’s whisky and craft gin industries are booming, and the choice can be baffling. If you fancy yourself as a bit of a whiskey/gin connoisseur, join this tasting with an expert guide on Thursday evening. 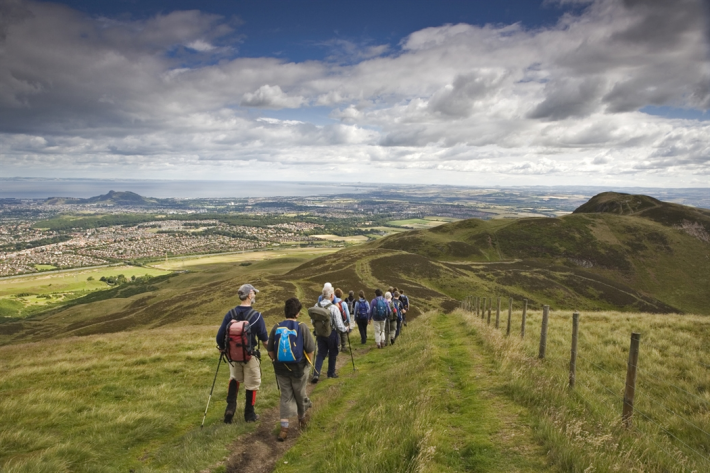 The Pentland Hills are a range of hills to the south-west of Edinburgh, and provide excellent hill walking within easy reach of the city, with superb views of the capital whilst further into the range there is wonderful ridge-walking along. Get your walking boots on, grab a waterproof, and join this guided hike, including transport and a sandwich lunch. Scotland’ coasts are home to impressive seabird colonies, and research on seabird and mammals is showcased at the Scottish Seabird Centre outside Edinburgh. This full day trip will have an optional boat trip around the Bass Rock available weather permitting. Waterproofs essential for boat trip! The RBGE is world famous for its collections, including large tropical collections. A guided visit will take you through the glasshouses, and weather permitting, the gardens. The Ochil Hills is a range of hills in Scotland north of the Forth valley bordered by the towns of Stirling, Alloa, Kinross, Auchterarder and Perth. Drive across central Scotland to Stirling to visit the Ochil Hills above Stirling University. You can also visit also the National Monument to William Wallace at an extra cost. Head over to the famous Holyrood park and learn about the complex geology of Edinburgh’s extinct volcanoes. Head to the top of Arthur’s seat, for stunning views across the city.